The present piece will immediately impress the savvy collector with its wonderfully original, aged dial. 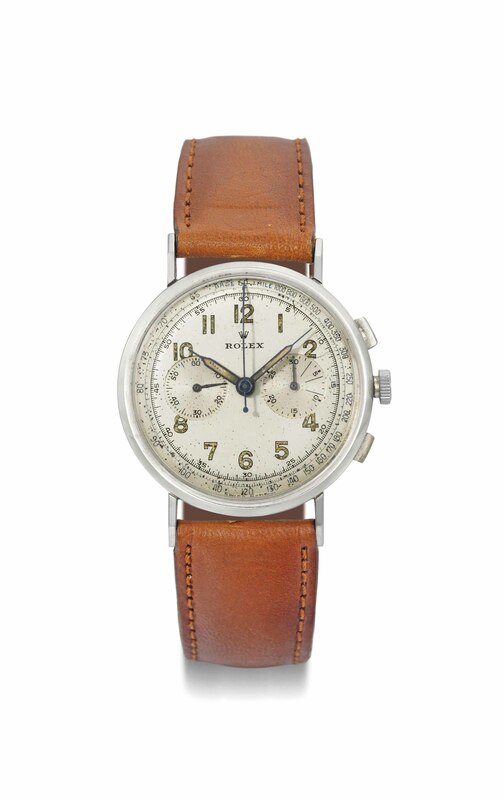 The color shift on the luminous material combined with the slight spotting of the dial, while the scales are still all perfectly preserved, adds pathos to this already very attractive and rare pre-war Rolex chronograph. Prospective buyers should be aware that the importation of Rolex watches into the United States is highly restricted. Rolex watches may not be shipped into the USA and can only be imported personally. Generally a buyer may import only one watch into the USA. For further information please contact our specialists in charge of the sale. Please note other countries may have comparable import restrictions for luxury watches. Why are watch collectors drawn to ‘honest’ vintage watches such as those with tropical and exotic dials offered in Dubai?